UNITED NATIONS (Reuters) - A team of U.N. experts finished gathering evidence of a suspected chemical weapons attack that killed hundreds of people in suburbs near Damascus last week, the United Nations announced on Friday, though envoys said analyzing the samples may take weeks. The announcement the U.N. inspectors will not be releasing their findings immediately came as Washington suggested the U.N. investigation would have no bearing on its decision about whether to attack Syria in retaliation for the alleged poison gas attack on civilians. Russia, diplomats said, was hoping to use the time needed to complete the U.N. probe to slow down the push for air strikes. Washington has left the timing of any action unclear. U.N. spokesman Martin Nesirky said the inspectors would be leaving Syria on Saturday but would return later to investigate several other alleged poison gas attacks that have taken place in Syria during the country's 2-1/2-year civil war. "The samples that have been collected will be taken to be analyzed in designated laboratories, and the intention of course is to expedite the analysis of that sampling that's been taken," Nesirky said. He offered no timeline for when that analysis would be completed, but said all samples would need to be fully analyzed. "This is not an electoral process, where you have exit polls and preliminary results," he said. "This is a scientific process. The only result that counts is the result of the analysis in laboratories and the analysis of the evidence that's been collected through witness statements and so on." He was addressing reporters while U.N. Secretary-General Ban Ki-moon was meeting with delegates from the five permanent U.N. Security Council members - Britain, China, France, Russia and the United States - to update them on the U.N. investigation in Syria. Envoys from the five countries gave no details of the meeting to reporters after it ended. But two diplomats told Reuters that Ban informed the five delegations that analysis of the samples could take up to two weeks. Ban cut short a visit to Europe amid concerns that Western powers are preparing military strikes against Syria to punish the government of Syrian President Bashar al-Assad for the chemical attack. Assad's government, like Syria's ally Russia, blames the rebels for the attack. France said on Friday it still backed military action to punish Assad's government, and Washington pushed ahead with plans for a response despite a British parliamentary vote against a military strike. An unclassified report by U.S. intelligence agencies released on Friday said the attack killed 1,429 Syrian civilians, including 426 children. U.S. Secretary of State John Kerry said on Friday the U.N. experts could not provide the United States with anything it did not already know about the August 21 incident. The U.N. inspectors' mandate dictates they will only seek to determine whether chemical weapons were used, not who used them. 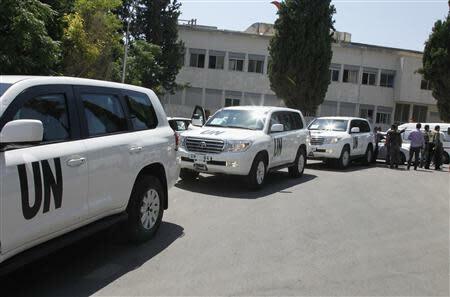 Western diplomats said that limitation undermined the usefulness of the inspectors' findings. Shortly afterward, U.S. President Barack Obama blasted the U.N. Security Council for its "incapacity ... to move forward in the face of a clear violation of international norms." Russia, backed by China, has used its veto power in the Security Council three times to block resolutions condemning Assad's government and threatening it with sanctions. U.N. diplomats said that Russia, anticipating military action against Syria soon, might call an emergency meeting of the 15-nation council over the weekend to urge countries to wait for the U.N. investigation results before making any decisions. "Russia wants to use the Security Council and the time it takes to produce a report on the U.N. investigation to slow down the momentum toward action," a Western diplomat told Reuters on condition of anonymity. U.N. officials say the world body's findings will be important because they will be widely seen as irrefutable, in contrast to doubts that arise with intelligence in light of the erroneous information on Iraq's weapons of mass destruction programs that was used to justify the 2003 invasion. Asked about rumors that all the U.N. investigators had left Syria already, Nesirky said the experts were still there and would be departing on Saturday, although translators and some support staff had already left. Earlier this week, Syria's U.N. envoy asked the United Nations to order chemical experts in Damascus to investigate three rebel attacks in which he said Syrian troops "inhaled poisonous gas." Nesirky said the team began an inquiry into those allegations on Friday. "Today the mission visited a government military hospital in Damascus as part of its evaluation of information provided by Syria on that," he said, adding that the experts would continue searching for evidence when they return to Syria. The United States dismissed the appeal by Syria's U.N. envoy, saying it had stonewalled the U.N. experts for months. The United Nations has received at least 14 reports of possible chemical weapons use in Syria. 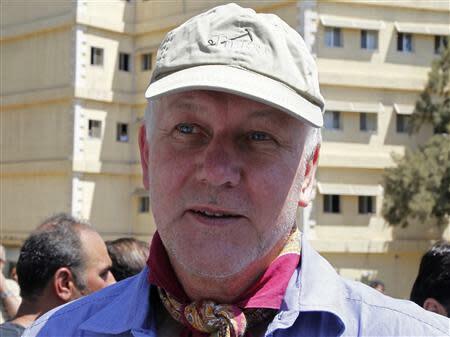 After months of diplomatic wrangling, the U.N. experts, led by Swedish scientist Ake Sellstrom, arrived in Syria on August 18 with a 14-day mandate to visit the country. The U.N. team was initially going to look into three incidents, but its priority became last week's attack.